“RAMONES – ROCK ‘N’ ROLL HIGH SCHOOL” 1979 BUTTON. JEWISH HOLOCAUST RELATED CIRCA 1980 BUTTON. JEWISH SLOGAN MASTER BUTTON FROM LEVIN COLLECTION. “PLANNED PARENTHOOD / CHILDREN BY CHOICE” BUTTON WITH ART BY FAMOUS CARTOONIST WHITNEY DARRAH. EARLY 1960s JOHN BIRCH SOCIETY FOUNDER ROBERT WELCH. 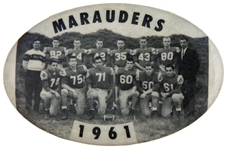 HIGH SCHOOL STUDENT RIGHTS 1960s ISSUED BY SMC - STUDENT MOBILIZATION COMMITTEE BUTTON. 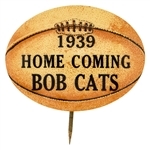 HOME FOR INFANTS GRAPHIC BUTTON. JEWISH STAR OF DAVID BUTTON TRIO FROM 1920s CHICAGO. 1907 PA. TEMPERANCE LEGION DELEGATE BADGE / BUTTON. 1940s COMMUNIST RED SCARCE “SOS – SAVE OUR SCHOOL / BROOKLYN COLLEGE” BUTTON. “WORLD WAR II / ARC” AMERICAN RED CROSS” OFFICIAL ENAMELED BRASS PIN. “TWA JUNIOR PILOT” EMBOSSED BRASS WINGS. “PALESTINE EXHIBITION” WITH 5 RED CROSS SYMBOLS CIRCA FIRST WORLD WAR BUTTON. 1980s BUTTON PROTESTING SOVIET TREATMENT OF JEWS. "FREEDOM FOR SOVIET JEWS" 2.5" BUTTON. LARGE 1981 “WILFPF/WOMEN’S INTERNATIONAL LEAGUE FOR PEACE AND FREEDOM” BUTTON. EDDIE FISHER 1950s BUTTON PROMOTING UNITED JEWISH APPEAL. 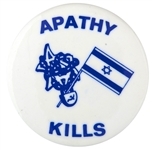 JEWISH “APATHY KILLS” BUTTON PROTESTING SOVIET TREATMENT OF JEWS CIRCA 1980. “GOYIM FOR ISREAL” 1977 JEWISH CAUSE BUTTON. LARGE LITHO BUTTON FOR JEWISH CAUSE CIRCA 1980. “NADC” NATIONAL ASSOCIATION OF DEMOCRATIC CLUBS PRO BRYAN WITH “TH. JEFFERSON” PORTRAIT BUTTON. EARLY “AMERICAN SCHOOL OF CORRESPONDENCE / STUDENT” BUTTON. BEATLES YELLOW SUBMARINE WITH CHRISTIAN PHRASE “OIKOU MENE” VIETNAM ERA PEACE BUTTON. SUNDAY SCHOOL SUPPLIER “SERVE HIM WITH A PERFECT HEART” CIRCA 1900 BUTTON. SUNDAY SCHOOL SUPPLIER “JUDGE NOT THAT YE BE NOT JUDGED” CIRCA 1900 BUTTON. “THE END IS NEAR / ST. MATT. 24:3” BIBLE SCRIPTURE BUTTON. 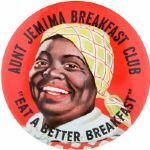 “MOTHERS AND BABIES HOME” CHOICE COLOR CONTRIBUTOR’S BUTTON. 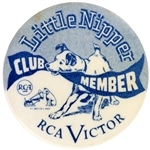 “MEMBER FAN CLUB – SAM LEVENSON” EARLY TV COMEDIAN / HOST CLUB BUTTON. “PUT A CAP ON PACS/JOIN COMMON CAUSE” EARLY COMMON CAUSE CITIZEN GROUP ANTI-POLITICAL ACTION COMMITTEES LITHO BUTTON. WORLD WAR I BOYS PATRIOTIC VOLUNTEERS PAIR OF MEMBER ITEMS. “THE ARMOUR / SOLDIERS AND SAILORS COMFORT CLUB” RARE WORLD WAR I BUTTON. SCHOOL BUTTON FROM 1960s NAMED FOR LYNDON JOHNSON. GRAPHIC AND SCARCE 1990s “ZZ TOP INTERNATIONAL FAN CLUB” BUTTON. JEWISH CAUSE LITHO BUTTON FROM 1970s. JEWISH CAUSE LITHO BUTTON LIGHT BLUE VARIETY FROM 1970s. “NEVER AGAIN” 1970s JEWISH CAUSE BUTTON WITH STAR OF DAVID. “FREEDOM FOR SOVIET JEWS” 1970s JEWISH CAUSE BUTTON. 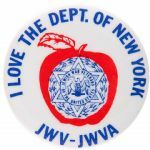 JEWISH WAR VETERANS NEW YORK LOGO BUTTON. "FREEDOM FOR SOVIET JEWS" LARGE EARLY 1970s BUTTON. JEWISH CAUSE SCARCE LARGE LITHO BUTTON WITH HEBREW & ENGLISH TEXT. JEWISH CAUSE BUTTON FROM 1970s WITH HEBREW WORD “ZACHOR!” (IN ENGLISH “REMEMBER”). UNITED JEWISH APPEAL BUTTON CIRCA 1973 INSPIRED BY GEN, MOSHA DYAN'S EYEPATCH. “LET MY PEOPLE GO” CIRCA 1975 JEWISH CAUSE BUTTON. “LET MY PEOPLE GO” MID – 1970s JEWISH CAUSE BUTTON. “FREEDOM FOR SOVIET JEWRY” MID 1970s JEWISH CAUSE BUTTON. “FREEDOM SEDER 19 APRIL” CIRCA 1974 TO SUPPORT FREEDOM FOR SOVIET JEWRY BUTTON. “THEY CAN’T STOP ME / SOLIDARITY SUNDAY APRIL 28” JEWISH CAUSE CIRCA 1970s LITHO BUTTON. 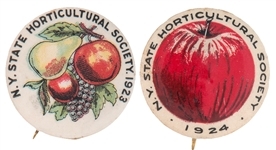 GORGEOUS "DELEGATE" BUTTON FOR CHRISTIAN CONVENTION 1902. “DAUGHTERS OF UNION VETERANS OF THE CIVIL WAR 1861-65” CIRCA 1930s BUTTON. "FIGHT NAZISM/AMER. FED. OF JEWISH NAZI VICTIMS" BUTTON. "SOVIET JEWRY WILL BE REDEEMED" BUTTON. UNAUTHORIZED "MOSHE MOUSE" DESIGN INSPIRED BY ISRAELI MOSHE DAYAN. 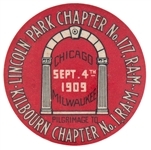 EARLY AND RARE RELIGIOUS BUTTON CIRCA 1901.